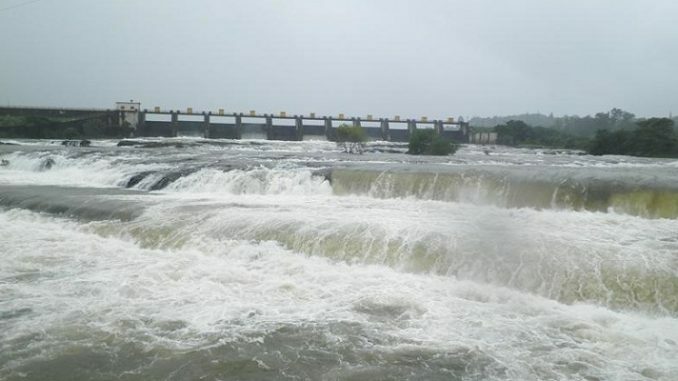 A fortnight of continuous rain has enhanced the water stock in 35 out of 91 major reservoirs in India, with three dams, including Khadakwasla in Pune, having reached their full capacity in the ongoing monsoon season, according to a report by the Central Water Commission. At least 35 reservoirs, mostly in the western, south peninsular and central parts of India, hold 50 per cent water stock of their total capacity. According to the live water stock calculated till July 19, three reservoirs, including Khadakwasla, reached optimum capacity within a month-and-a-half of the monsoon this year. “With water levels continuously at optimum capacity, water was released on multiple days from the dam. So far, we have released between 20,000 to 25,000 cusecs of water,” said an official in-charge at Khadakwasla dam. Along with Khadakwasla, water from Krishnaraja Sagara and Hemavathy in Karnataka, too, was released earlier this month. As on July 19, the water stock recorded in the western region, comprising 27 reservoirs in Maharashtra and Gujarat, was 7.89 TMC, which is 25 per cent of their total capacity. Last year, the available water stock was 26 per cent. In Maharashtra, Girna dam (12 per cent) in Nashik and Yeldari dam in Parbhani district remained the most deficient in water stock this monsoon season. Among the other dams which had marginally lower water stock than 2017, were Jayakwadi (21 per cent) in Aurangabad district and Manikdoh (32 per cent) in Pune district. According to meteorologists, particularly strong westerly winds have been blowing from the Arabian Sea this monsoon, which has brought abundant rain in the western region. “Though Gujarat received good rainfall only this week, the entire western coast has experienced a rather wet season. One of the main contributory factors has been very strong moisture-laden winds blowing over the coast, causing continuous rainfall,” said a senior meteorologist at the India Meteorological Department (IMD) in Pune. But the remaining 56 dams are yet to fill even up to 50 per cent of their capacity. Most of these dams deficient in water are located in the north and north-east regions, with a few in Gujarat, Andhra Pradesh and Telangana.